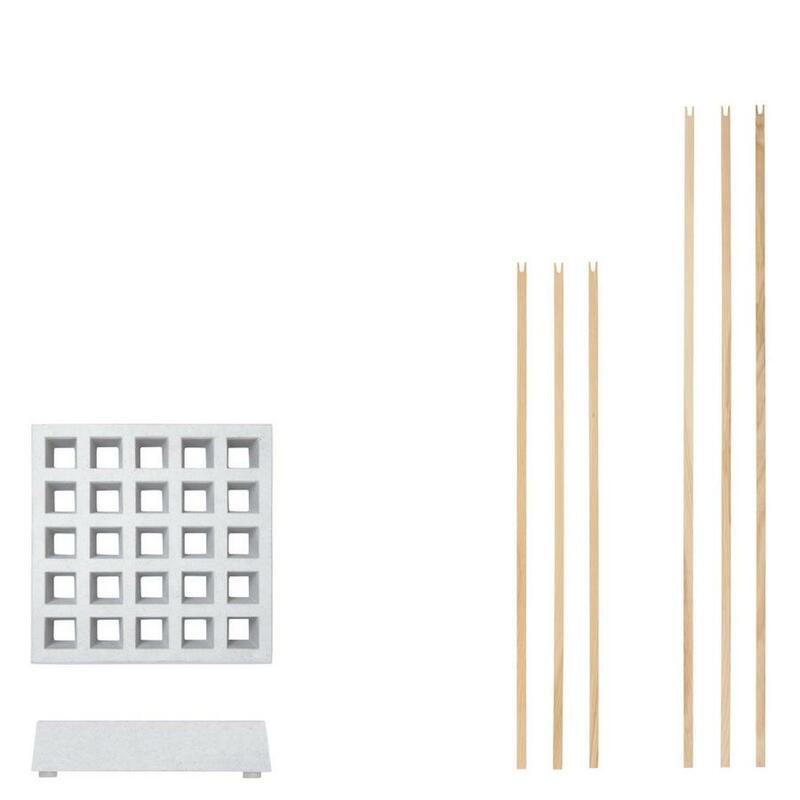 The design of the Pin Coat clothes rack is very simple: wooden rods are inserted in a cement pedestal from which are hung jackets, hats, scarves, dog leads and so on. In addition special rods convert this Moormann coat rack can into a functional umbrella stand (Pin Brolly) or light (Pin Light). Please note: The solid wood used by Nils Holger Moormann comes from European growing regions. Because solid wood is a natural product, deviations in grain and colour can occur. As can colour changes caused by UV light. In order not to adversely affect the texture, appearance and colour of the wood, use a surface sealant was deliberately avoided. Over time a natural patina can develop. Care Light, superficial, stains can be removed using a fine abrasive sand paper. Always sand in the direction of the wood grain! With oiled wood, unwanted stains can be treated with a colourless oil. Sustainability The inherent sustainability of Moormann products results from the use of natural materials and their processing into durable, often modular products, with room for adjustment. Through dispensing with fixed connections of different materials Moormann products be easily recycled. In context of distribution Moormann place value on small pack sizes and the use of recycled or recyclable packaging material. Around 90% of Moormann production is through regional suppliers. Can I add more rods? Yes. The product Pin Coat as sold includes the socket and the rods; however, both base and bars are also available separately in our shop. How heavy is the base? The small base weighs 8 kg and stands on protective plastic feet. How can I transform the clothes rack to a light? The Pin Coat Pin Light - consisting of a rod fitted with lamp shade and bulb - and can be ordered in the smow online shop. 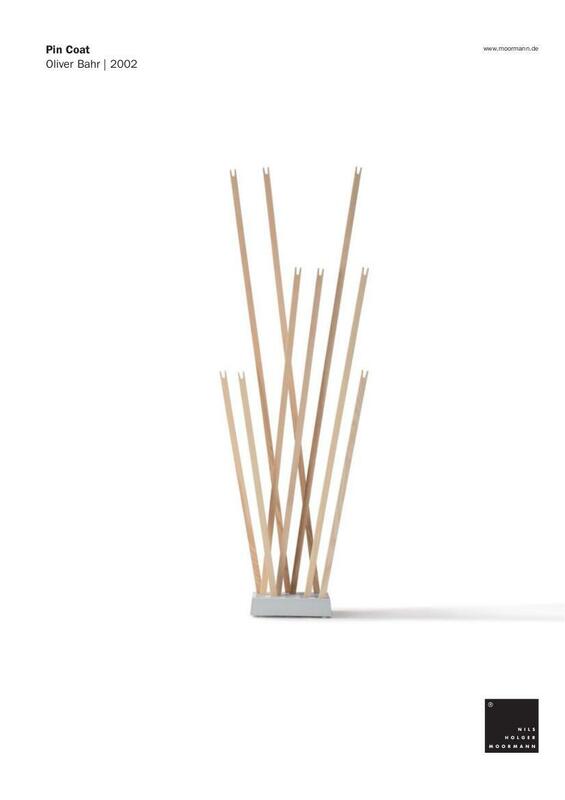 The principle of the clothes rack / coat stand Pin Coat is as exceptional as simple: wooden poles stuck loosely in a solid, cast cement base. The clothes can either be hung loosely over the rod ends or hangers can be inserted into the hook-shaped ends of the rods. Depending on requirements, the number of rods can be varied and because the rods of Moormann's Pin Coat are available in 3 different lengths can be adapted to fit everything from young childrens jackets to long trench coats. In addition, the Pin Coat can be extended by a range of multifunctional accessories. Thus, the Pin Coat can become the Pin Coat Pin Light with lights at the end of the rods, while Pin Coat Pin Brolly offers a refined extension for storage of umbrellas, and with the Pin Coat Pin Flag one has space for your notes and reminders. Consequently with Pin Coat from Moormann one has a modular, completely functional clothes hanging system with sculptural charm and minimalist design. 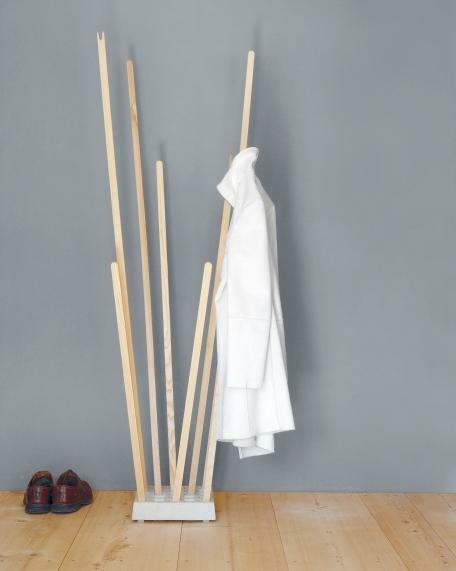 The Pin Coat coat rack was designed for Moormann by product designer Jens Oliver Bahr and is a product which remains true to his design credo "Achieve with little means a lot". From a limited number of simple items Jens Oliver Bahr has construct an elegant clothes hanging system that meets all contemporary requirements. 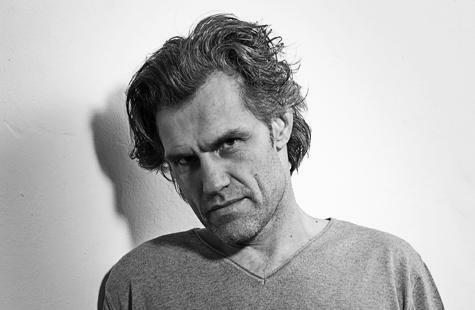 Having studied product design in Hildesheim under Professors Werner Bünck and Werner Sauer, since 2011 Jens Oliver Bahr has co-operated with his colleague Bastian Demmer under the label statthocker.de on a range of projects for which they have received many international awards. Also Pin Coat has since its inception been nominated for - and won - numerous international awards. The Pin Coat wardrobe is made by Nils Holger Moormann in Aschau im Chiemgau. As a company Moormann begin co-operating during the product development phase with local small and medium-sized companies, many of whom Nils Holger Moormann has often co-operated for years. This production method is an important part of Moormann philosophy - promoting regional structures among a wide variety of professionals who can communicate with one another directly involved in the development of the furniture and thus save unnecessary transport and travel. 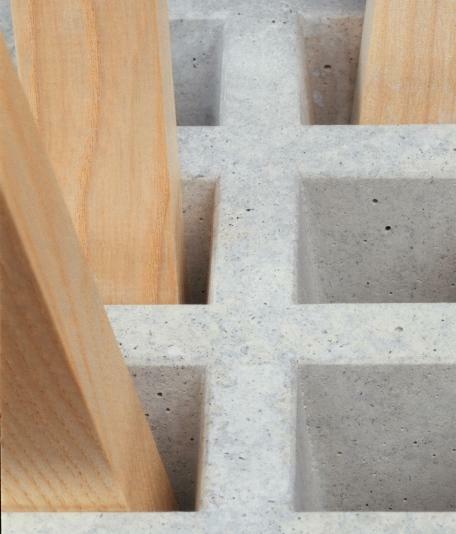 In terms of sustainability Moormann focuses on natural materials. 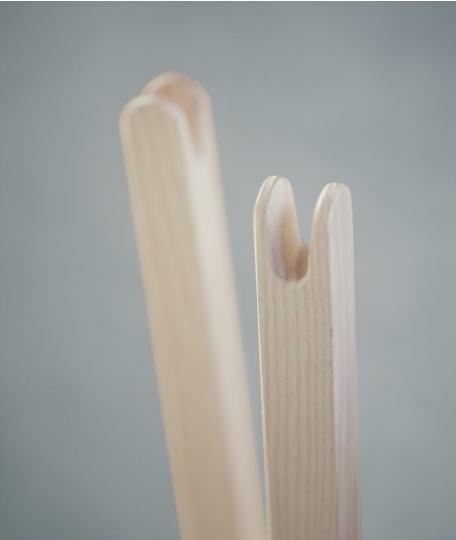 As with the bed Siebenschläfer or the shelf system FNP, Pin Coat uses exclusively European sourced wood. 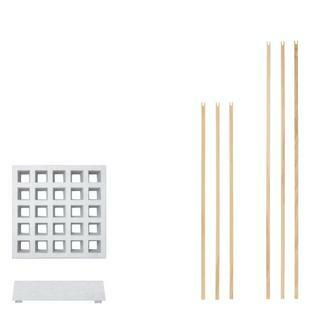 The Pin Coat coat rack is composed of a cast concrete base and is offered with rods of ash or oiled walnut. After abandoning law school in the early 1980s Nils Holger Moormann, felt called to design and for all to helping young, unknown, designers. What initially appeared a reckless strategy has evolved over the years into a very successful small company that produces a portfolio of designs from international designers. Moormann furniture is characterized by a reduced aesthetic and deliver with much charm and wit original solutions for everyday, functional problems. Whether the FNP shelf system or the coat rack /clothes rack Pin Coat all Moormann furniture is created without bonded joints and thus can easily be assembled. Located in Aschau im Chiemgau, Moormann employ a permanent staff of 20 employees who manage the creation, production and distribution of projects new and less so. In addition Moormann have converted from the remains of a listed former hotel into the design auberge Berge. There you can test Moormann's Pin Coat, Tagedieb, Buchstabler and other Moormann designer furniture objects.